University "treating all patients with influenza-like symptoms as if they have H1N1"
SEATTLE, Washington (CNN) -- An outbreak of flu at Washington State University shows few signs of slowing down as more students report symptoms suspected of being from the H1N1 virus, school officials said Thursday. 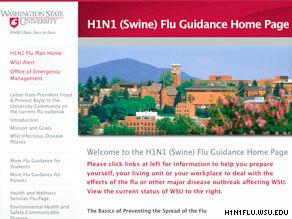 WSU Web page gives information, advice to students who suspect they may have H1N1 virus. More than 2,600 students have come down with possible cases of H1N1 since classes began August 24, said James Tinney, WSU director of media relations. "It takes about three to four days to get over the virus, so many of the people who have had it are already feeling better and are back in class," he said. On Thursday, 128 new suspected cases of the virus, also known as swine flu, were reported among the nearly 18,000 students who make up the school's Pullman, Washington, campus, said Dr. Dennis Garcia, health and wellness associate medical director. One student has been hospitalized for dehydration and is recovering, according to a university news release. Garcia said the school may have to wait for the outbreak to run its course. "If you follow the CDC's predictions that up to 50 percent of a population could become infected, then we might be looking at 9,000 people here," he said. The school said that while it is no longer testing sick students to confirm H1N1, it is following guidelines from the Centers for Disease Control and Prevention and the local health department by "treating all patients with influenza-like symptoms as if they have H1N1." But despite the school's best efforts to track the outbreak, officials said they may not have an accurate count of how many people have fallen ill. "We have no idea how many people are in their rooms choosing to self care," Garcia said. But Tinney said the students and faculty are not alarmed. But Tinney said officials were surprised that the long Labor Day weekend, when most students left campus, did not do more to interrupt the virus' spread. "I guess we are an early test case of how this virus will spread over the population," Tinney said.